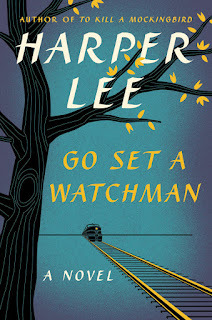 Fifty-plus years after the publication of Harper Lee's To Kill a Mockingbird and after months of anticipation, today sees the release of Lee's new book, Go Set a Watchman. As the release has approached, however, controversy has swirled that, as a New York Times headline puts it, Watchman "gives Atticus Finch a dark side." The article continues, "Shockingly, in Ms. Lee’s long-awaited novel ... Atticus is a racist." Though the article offers some nuance farther in, the headline perpetuates a talking point common across numerous articles on the book. Just today, an Associated Press article includes the subhead "Still a Hero?" and interviews a reader who says, "I'm reserving opinion, but I'm ready to be mad. [Atticus is] the epitome of the moral compass." The Guardian announces Atticus "may in fact be a villain" and both that paper and the Chicago Tribune worry after people and businesses named "Atticus." What these articles downplay, of course, is that no author "makes" a character anything, so much as authors use the characters of a book in aggregate in order to say something. The question is not of whether Lee portrays Finch as racist so much as what Lee is trying to say by portraying Finch as racist -- what statement is being made about the times, or about changing viewpoints, or about caring for aging parents? To be "mad" about what Lee has purportedly done is to miss what's being communicated in the doing of it. Of course, all of that even further ignores the specific context of Go Set a Watchman's release, born almost fully from an early draft of Lee's To Kill a Mockingbird. Though popularly called a sequel, Watchman is more properly a prequel (and we know, to mix pop culture metaphors, how well that turned out for Star Wars), and further, given the revelation that Tom Robinson's trial ended differently in Watchman than in Mockingbird, Watchman might even more properly be considered an "alternate reality." The real truth of the matter is not that Lee "made" Finch racist, but rather that she converted him from racism in earlier drafts to his moral upstandingness in later drafts. What a reader might take from Go Set a Watchman is not how far Atticus Finch has fallen, but an indication of how far Finch has come, draft by draft. This idea of alternate realities -- characters who might look or sound the same, but then act differently -- is already familiar to comic book fans. For a long time, DC Comics portrayed Superman growing up as Superboy before Ma and Pa Kent died and he moved to Metropolis. In later iterations Superman was never Superboy, and the Kents lived to see Clark Kent married to Lois Lane. Most recently the Kents died in Clark's early adulthood and he initially patrolled Metropolis in a T-shirt and jeans. Stories have Kal-El's spaceship landing in Kansas, and Gotham City, and Soviet Russia. Surely the Marvel Cinematic Universe, while featuring characters with similar names and abilities from characters in the comics, takes liberties with classic versions of the heroes. In DC Comics, Batgirl Barbara Gordon was shot and paralyzed by the Joker, and then became the technological powerhouse Oracle; more recently Barbara was shot by the Joker but recovered, and retook the Batgirl mantle to patrol a hip suburb of Gotham. Kid Flash Wally West was once a kid who worshipped the Flash; now he's a kid who hates him. DC and Marvel each just made summer events of alternate versions of their characters meeting one another, in Convergence and Secret Wars respectively. Comics fans know all too well that you can take the very same characters, shake them up a bit, and tell a multitude (nay, a multiverse) of stories with them. Every comics fan has "their version" of a character, and new versions don't take away from what a reader loves best. Be they superhero or small-town lawyer, surely readers can grasp different presentations of a character without one necessarily eclipsing the other. People writing about Go Set a Watchman should be familiar with these conventions just from looking at the works of other writers of the Southern Gothic. Faulkner's Absalom, Absalom! is essentially an alternate-reality prequel/sequel ("interquel"?) to The Sound and the Fury. The short story "That Evening Sun" is a straight-up alternate version of part of The Sound and the Fury as well. Additionally it's problematic that some media, at least, are resolved to tell the easiest version of these events -- which is to say, "sequel" -- when the truth is more important, complicated, and nuanced. Comics have the exact same problem in the popular media; I'm thinking of the hubbub over Green Lantern being "made gay," when the facts were more nuanced (and it shouldn't have been a hubbub anyway).